I have posted these little gems several times before. They are just so cute and delicious I wanted to share them with you again. I made these for a friend's baby shower. You can guess she was expecting a little girl. If you have not got around to trying these yet, you really should. 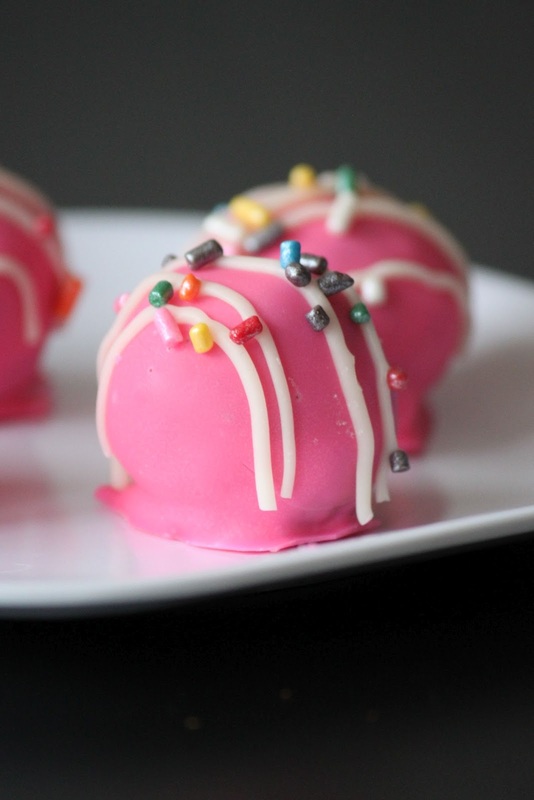 They are easy, delicious, and everybody loves them! Melt candy melts in the microwave per directions on package (30 sec intervals, stirring in between). 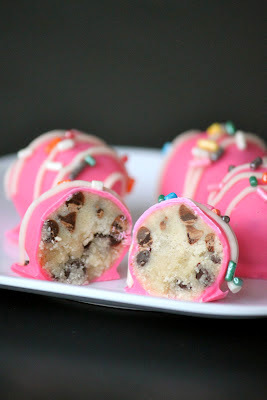 Gently dip the cookie dough ball into the candy coating. Once covered, remove and let the excess chocolate fall off. Place back on wax paper to dry. To decorate with drizzled chocolate, place melted chocolate in a plastic sandwich bag. Using scissors, cut the very tip off the sandwich bag. The smaller your cut, the smaller the drizzle. Use the sandwich bag to pipe the chocolate back and forth over the cookie dough truffle until you reach the desired look. If you chose, top with sprinkles. Hi Risa? Your blog was so great. All the foods that you have posted are all delicious. I really want to cook it this week ends. Thanks for the great post of yours! This content was perfect for my blog learn your Christmas carols blog. This year I would like to include links on Christmas recipes. The only requirement would be a link back in your side bar or footer. If you are interested please email me at juliegallaher@gmail.com.